As I was recently reading A Killer Read, (you can read my blog post on that Cozy here), I couldn’t help but notice how often Lizzie and her fellow Book Club members mention their favorite mystery authors. The novel even introduces most of them at about the same time as they mention some of their own personal favorite reading material, a good way for canny mystery lovers to get a flavor of the sort of person each might be from their literary leanings. Quotations from mystery authors also begin each chapter. There are even reading lists at the end of the book of other mysteries that are thematically appropriate for each member of the Ashton Corners Book Club. So I thought I’d ask if you enjoy seeing mentions of your other favorite authors in Cozies that you are reading. Personally I like it >>> as long as it is appropriate to the book! Also, are there any other series that you can think of that insert a character’s personal reading material into the setting that you particularly enjoy? If so, please post a comment. Thank you! I also enjoy seeing other authors and their books mentioned in series that I’m reading, but I agree–it must be appropriate. I am often introduced to a new author this way. However, if it’s too blatant an advertisement, it’s not enjoyable and puts me off the story/author. One book I just read has mentioned another author. In Ann Charles’ last Deadwood Mysteries book, Wild Fright in Deadwood, her character Natalie continues to pull in what she’s learned of ghosts and the paranormal world from Terri Reid’s Mary O-Reilly series. The reference fit well and had me chuckling as I’ve read Terri Reid’s books and totally got where Natalie was coming from. I think I have noticed that in a couple of ‘book club’ type series I have read in the last couple of years, but of course I can’t remember which ones they were. I LIKE it! It gives me ideas of other Authors to try. So I am sorry I can’t help identify the others right now, but will keep that in the back of my mind. Maybe some other readers have better memories than I do. Carolyn Hart’s Death on Demand series! Annie, proprietor of Death on Demand mystery book store, appreciates the authors and books she deals with and recommends to customers. Carolyn Hart’s Death on Demand series is full of mystery writers, of course. I have often went ahead in search of a book which was “featured” in the series of Annie’s posters displayed in the store. I’m another one who adores the Death on Demand series — and always try to guess the books portrayed in the paintings of the month — that’s one of my favorite things in her books! And of course at the big “reveal” at the end — I’m thrilled if I guessed even 2 or 3 of them correctly — and then of course I go look up the ones I didn’t guess! I agree that when there’s mention of what a character is reading, it gives us a glimpse into that character’s personality — same with her food choices, etc. 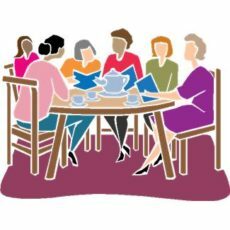 Of course in the context of a book club or bookstore setting, but even more so in a non-book related setting — that is — if a character mentions that’s she’s planning a quiet weekend with the newest (insert names of 3 favorite cozy authors) — then I just know I’m going to like her! I also like when the characters themselves “cross over” — that is, when a character from one author’s series walks into the store owned by a character from another author’s series, for example! So much fun! I love that Elizabeth J. Duncan’s Penny Brannigan is friends with Jeanne M. Dams’ Dorothy Martin, and that the two women visit with each other in their books — so much fun! Ooh, now you’re making me want to read those. Love crossovers. What a fun idea! I think it’should a wonderful way to bring the characters to life for the reader. Readers also get introduced to new authors in a subliminal way. Love it. Thank you so much for sharing this. I used to read Death on Demand with a notepad to write down the authors, and I LOVE the paintings she has created for the contest each month. (Not telling more). Alice Duncan’s Daisy Gumm series’ main character is a reader and particularly likes mysteries. The unique thing here is that the books are set in the 1920s so the authors are from long ago–but I love period mysteries so that works for me. I’ve researched several of the author’s she’s mentioned. If I remember correctly (not a given these days) I’ve found Mary Roberts Rinehart, Anna Katharine Green and Earl Derr Biggers this way (some of their books are available on Project Gutenberg, if you’re interested in trying them). Intertextuality, is what you all are calling “name dropping. Thomas Phynchon is the most well know author that utilizes intertextuality. But you have to have read a lot of literature to get most of them. He is highly educated in the Literary arts. Thanks for your comment about Thomas Pynchon. Personally, I don’t like it. I think it cheapens the book at hand. I see this ALL THE TIME. In fact, too numerous to even remember specifics. It usually DOESN’T have anything to do with the story (like book clubs, library, etc.). The protagonist/lead character either is relaxing in a favorite chair or is reading in bed before sleeping. Of course, she is reading one of her ‘favorite’ cozy mystery authors, which she names. It never bothers me, I just usually chuckle. It also doesn’t influence me, I don’t even take note of the ‘mentioned’ author to remember at a later time. However, I have also often seen an author thank several other cozy author friends in the ‘acknowledgements’ for helping with this particular book. Then, they are sometimes mentioned in the story line as the author of a current book they are reading (while relaxing). In many ways I think it’s a ‘promo’ for a particular cozy author. AND, I certainly don’t blame cozy authors for trying to help each other. It just never has an effect on me. Eva Gates’ Lighthouse Library Mysteries series (now sadly discontinued by the publisher) also mentions ‘real-life’ authors. I must say I am a fan of Ms. Gates’ writing, and hope to see more Lighthouse Library mysteries some day. Off-topic, but I’m really sorry to hear this series has been discontinued. At the very least the publisher should allow one more book, to tie up the ongoing story lines. When this happened to Amanda Flower in one of her series, she self-published one last book. This author is writing three other current/ongoing series under her name – Vicki Delany. Writing four books/year is a lot for any author, no matter how gifted or prolific they are. I’ve been enjoying the ‘Year Round Christmas Mysteries’. In actuality, there are parallels in this series and in the Lighthouse Library series (which I thought ironic). We had fun in our last book, The Silence of the Chihuahuas, writing scenes featuring Caro Lamont, an animal therapist from Sparkle Abbey’s series of pet-based mysteries. She is invited to Seattle to audition for a show in which canine experts work with problem dogs. Of course, Felix Navarro, the boyfriend of our human protagonist, is also auditioning for the show and Pepe, the Chihuahua protagonist, who has suddenly stopped talking, is analyzed by both of them. For Caro’s cameo appearances we ran the text by Sparkle Abbey and got their approval. It was a fun way to acknowledge how much we enjoy their mysteries. We first met them on a panel about animal mysteries at Bouchercon. I am a big fan of Sheila Connolly’s Orchard series featuring Meg Corey. I was delighted when I found a quick mention of the main character in Edith Maxwell’s Farmed and Dangerous, buying heritage apples from Meg. By the way, Farmed and Dangerous is a fun snowbound cozy, as are A Fright to the Death by Dawn Eastman and Quilt Trip by Elizabeth Craig. Lenora, thanks for the recommendations – I’m always interested in hearing what people are reading and loving!